Carling Physical TherapyNewsTherapyArms fall asleep at night? Have you ever woken up in the middle of the night and one or both of your arms are asleep? This can be not only uncomfortable, but also very scary. While there are many potential issues that might be contributing to this, the problem can be located in your neck. In particular, this may be an issue with your scalene muscles. The scalene muscles are a pair of muscles located in the front of your neck on either side down to your first two ribs. Each side is divided into three separate sections, anterior, posterior and middle, that perform different functions. They bend the head side to side, flex the neck forwards and lift the first two ribs when breathing. The picture above represents the brachial plexus, which includes the subclavian artery and ulnar and medial nerve, in which innervates the scalene muscles. The subclavian artery provides the blood supply for the entire arm. The ulnar and medial nerves are major nerves for the arm. How do the scalenes cause arm pain when I sleep? 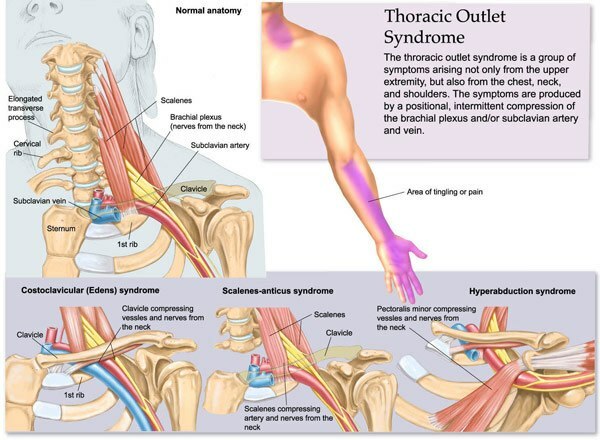 There are a couple of causes for the arm pain related to the scalenes. First, everyone’s physical makeup can be a little different and the position the nerves innervate the scalenes can increase the potential for impingement on the nerves and blood supply. For the purpose of this topic we focus our attention on your sleeping posture but work posture, and overuse injuries. The sleeping position can be the most significant contributor to your arms falling asleep. Sleeping on your stomach is the worst position for your neck and arms. Laying on your stomach shortens the scalenes and increases pressure on the brachial plexus, leading to blood flow constriction and nerve impingement. Stomach sleeping encourages you to put your hands above your head and maintaining your neck in a static rotated position. Many stomach sleepers will experience numbness and pain in both arms at the same time. Side lying positions can cause the arm on the side you are sleeping on to fall asleep because you are putting all the pressure on one shoulder causing the scalene muscles to shorten on that side. Plus the weight of your body applies pressure on the brachial plexus. Typically side lying people will experience arm pain and numbness on the side they are laying on. Back sleeping is overall the best position to sleep, as long as your arms stay at chest level or lower. If you place your hands above your head you will potentially experience pain in both arms. How do you reduce the occurrence of your arms going asleep? The first thing to do is to improve your sleeping posture. Laying on your back or side is preferable to stomach sleeping, which should be avoided. If you are a side sleeper, make sure your head is properly supported. Finding the right amount of pillow support will help keep the neck in better alignment, reducing side lying curvature. Using a body billow will help keep the arms separated and supported. For back sleeping the important thing is to keep your hands from going higher than the shoulder. Make sure you perform the upper trapezius stretch and chin tuck periodically throughout the day to alleviate the tension built up in the scalenes. Lastly, if the issues are persistent seek medical assistance. Physical therapy, and massage therapy helps target the specific issues and can help address the issues originating in the neck and help you get a better night sleep and alleviate your arm pain and numbness.